Generate project style weekly calendar plans, from a task list and associated details. SOURCE CODE available for changes for VBA Macro developers. Consultant? Software Developer? Corporate IT? Supply your clients with your own version of our calendar software!!! Rebrand messages and interface with YOUR logos and trademarks Add missing features or adjust existing ones to your clients special needs. Supply it as your own product. Full access to the Macro source code. If you know Excel VBA you should have no problems understanding this macro. Request support and additional explanations using the Contact Us link on this website or select the support link on this page. Code includes generic comments, Function and Sub and Variable names are meaningful. You can request support and additional explanations using the Contact Us link on this website or select the support link on this page. 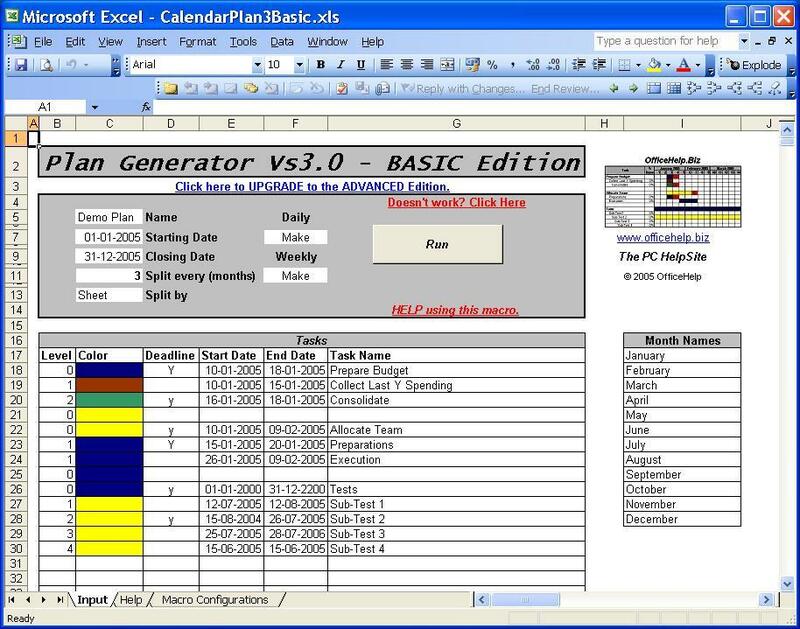 You have full rights to modify and redistribute the Calendar Plan Generator Vs3.00 to any existing or future external or internal client by personal relationship. You are strictly forbidden to redistribute, sell or made any version (modified or original) available to the general public, use it to advertise or attract new clients and to make it available on the Internet of any form and under any protocol. Macro can only be supplied to third parties under commercial relationships involving personal contacts. Distribution to internal clients within a corporation is allowed. 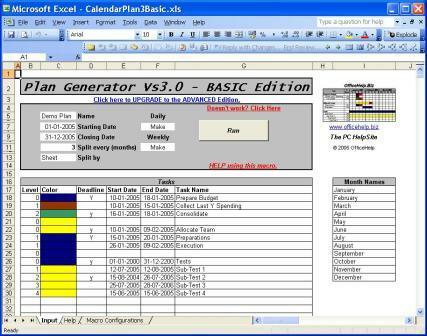 Source Code Edition is Vs3.0 corresponding to the commercial product Calendar Plan Generator BASIC Edition. The ADVANCED and CUSTOM Editions are not available for website purchase in Source Code mode. If interested, please Contact Us for a personalized purchase. SOURCE CODE EDITION: Includes access to the Macro Source Code. If you know how to develop in Excel VBA, you will be able to manipulate the code! Implement your own functionality. Replace our message boxes with yours! Rebrand the product for delivery to consulting clients ot for internal corporate distribution. If you have Microsoft® Excel®, you can now generate Project style calendar plans, just by entering the tasks and associated data like it's name and the starting and end date. 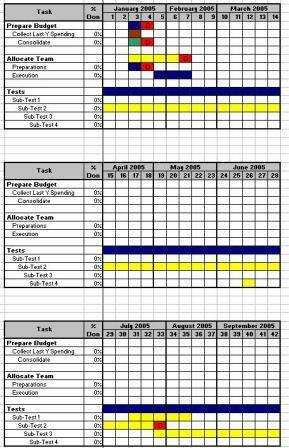 Use different colors and select a deadline terminator for each task. Indent each task to its level or sub-level. Really easy to use, just fill in the values in the Input Cells and press the "Run" button to . The system will generate a new workbook with the resulting Calendar (PICs. 2 and 3). This new workbook HAS NO MACROS on it, just the resulting calendar. Change, save and email it as any other regular Microsoft® Excel file. TWO types of calendar plan from the SAME task list! Yes. There are two sheets on the Microsoft® Excel Workbook (PIC. 4). The first one is the Input sheet, the second is the Help one. There is also an Online Help Page for this product (see bottom of page for all related links). After generation, the file can be manually changed as any other regular Microsoft® Excel file. There are no special features to the Calendar file, it is a regular Excel file with painted cells. It's a regular Microsoft® Excel file. There are NO MACROS on the resulting plan, only on the generator file. It can be freely copied and manipulated.